At South Florida Smile Spa, Nicole M. Berger, DDS , we offer the All-on-4® procedure for patients that are looking for a convenient way to replace missing teeth. If you live in the Pompano Beach area and have experienced tooth loss, we encourage you to visit our office to discuss the options available to you. 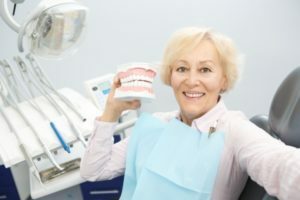 Dental implants as a whole have brought new hope to patients who formerly had to contend with ill-fitting dentures after losing their natural teeth. With the introduction of dental implants, however, these patients had an opportunity to have permanent teeth that are both more successful long term and more comfortable. Dental implants are also healthier for the mouth than dentures. This is because they maintain existing bone, they do not decay and are not susceptible to periodontal disease. Check out what others are saying about our All-on-4 Dental Implants services on Yelp: All-on-4 Dental Implants Pompano Beach. With the introduction of technologically-advanced dental implant procedures, such as the All on 4 Dental Implants procedure, patients are able to experience an even more exciting solution. This modern implant system is able to use as few of All on 4 Implants to support an entire arch of prosthetic teeth — either the upper or lower jaw. These replacement teeth are not able to be removed by the patient, so there is no concern that they could slip or move around in an embarrassing manner. In many cases, patients may have this entire process completed in just one day, dependent on how much bone is present for the implants to be placed. One of the common complaints of denture recipients is that they can no longer fully taste their food. This is because dentures cover a large surface area in your mouth. With the invention of All in 4s, dental patients can now enjoy fully tasting all their food as well as retaining the temperature sensations. All in 4s are also more comfortable and convenient than dentures. By applying pressure to your gums, dentures tend to cause great discomfort to patients. All in 4s do not apply pressure to your gums and feel just like natural teeth. You also never have to worry about applying denture adhesive. Many denture patients have trouble learning how to properly apply the adhesive and complain about the tastes of denture creams. All in 4s are your permanent solution to large scale tooth replacement! At the start of your visit your mouth will be numbed, ensuring your comfort during the procedure. Next, we will remove any necessary teeth and any infected gum tissue. We will then install the implants and cover them with temporary white caps. The gum tissue is sealed by dissolving stitches. Once your mouth has a chance to heel, we will replace the temporary caps with a strong natural permanent set of teeth. With All on 4 dental implants, you will leave our office with a healthy looking smile. Immediately after implant surgery, patients will need to consume a soft diet. Doing so will help ensure that the implants remain intact within the jawbone so that they can begin the process of integrating into the jawbone, this is what is referred to as “osseointegration”. Allowing this step to happen is one of the most vital elements of ensuring that the implants are successful. The other key to success is placing the implants in locations that allow them to lend the most effective amount of support to the new replacement teeth. Because these replacement teeth are then anchored to the implants for stability, their correct placement is extremely important. You should care for your implants the same as you should care for natural teeth. Brush and floss after each meal! Our expert dental team will be able to provide you with detailed information on any special treatment necessary for your specific dental situation. At South Florida Smile Spa, Nicole M. Berger, DDS , we can replace your teeth with this convenient and innovative procedure. To discuss the many benefits or to get started, call 954-395-2419 and schedule an examination and consultation with our Pompano Beach, FL dental office.